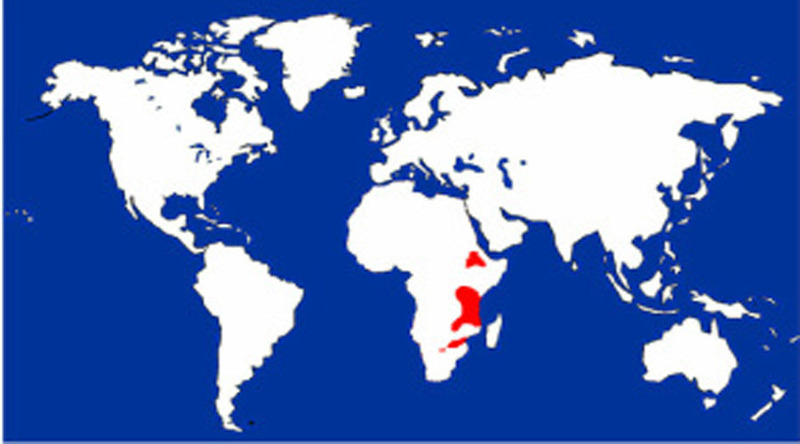 Forested parts of Ethiopia, Kenya, Tanzania, Malawi, Zambia, and Mozambique. Wild: Omnivore – eats primarily fruits, but will also eat insects, eggs, small mammals and reptiles, as well as nestlings. 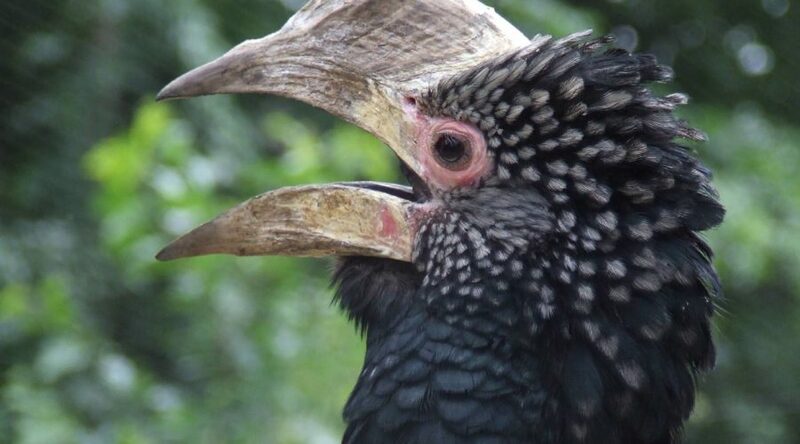 Hornbills are named for the large boy structure on the top of the beak. This bony is called a casque. While the exact function is unknown, it may act as an echo chamber that allows the hornbill’s call to be heard at great distances. The Silvery-cheeked Hornbill is largely frugivorous (fruit eating), preferring cherry-sized fruits with hard stones. This preference makes this species a crucial part of seed dispersal. After eating a piece of fruit, it may fly several miles to another roost, and regurgitate the seeds undamaged. When Silvery-cheeked Hornbills nest, the female is sealed inside of a tree cavity, except for a slit through which her mate feeds her. When the chicks are old enough, the female leaves the nest, and seals the chicks back in. Both parents continue to feed the young until they are old enough to leave the nest (approximately 80 days after hatching). This species of hornbill will come together in flocks of up to 200 individuals who will, as group, fly great distances to find new food sources.